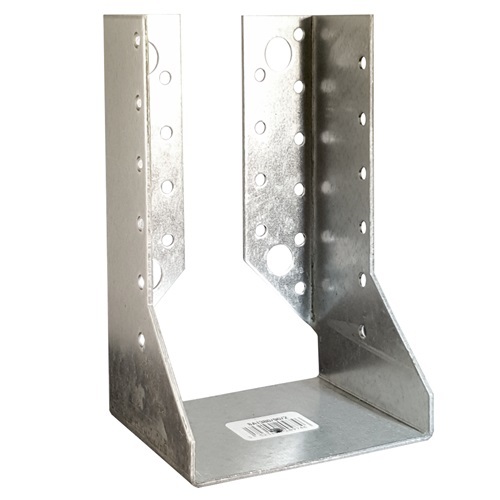 The Simpson Strong-Tie Heavy duty face fix hanger, designed for applications requiring additional strength. Hangers have bolt holes for 12mm fasteners into the face and whilst primarily a timber to timber hanger can be fixed to masonry using Rawl R-KF2 and M12 Studs. Made from blanks 250/380/500 & 620mm and bent to common timber widths. This means that often the same hanger will suit multiple heights of timber. The hanger depth is required to be 60% or more of the height of the timber unless additional lateral restraint is added to the top of the carried member. x 140mm Height Concealed Hanger Pre-galv.